We recently described how T-Mobile was playing crony capitalist DC games and talking out of both sides of its mouth. On one side, it told Wall Street that it’s in a great position. On the other side, it pleaded with federal regulators in DC that it needs their help in order to remain competitive in the wireless marketplace. 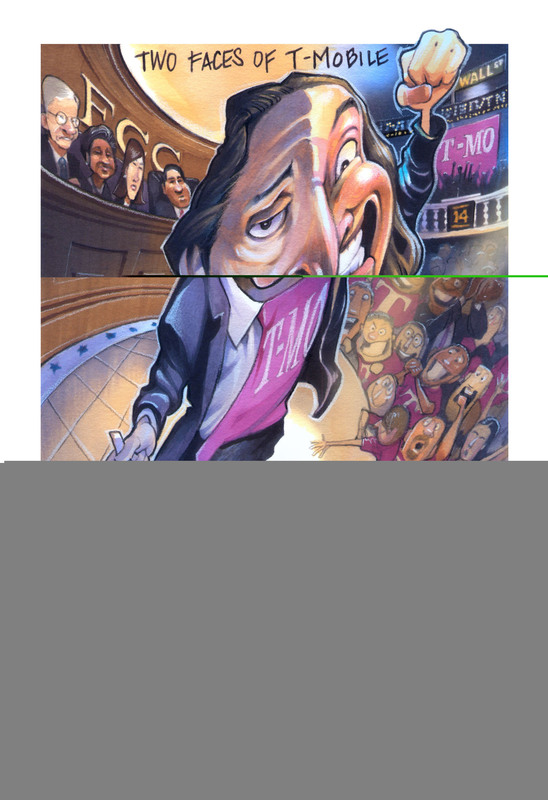 The company CEO, whom The Wall Street Journal’s Holman Jenkins labeled “Potty-Mouth” Legere, is now doubling down on the company’s “Little Sisters of the Poor” message to DC and calling for a larger set-aside in the upcoming spectrum incentive auction. The Obama Federal Communications Commission (FCC) already promised to set aside 30 MHz, but that just wasn’t enough for T-Mobile. Now Mr. Legere and the Save Wireless Choice coalition – which conspicuously counts T-Mobile, Sprint, and DISH as members – are pushing for at least 40 MHz. That set-aside proposal is a bad idea for several reasons. First, T-Mobile wants the FCC to make it easier for it to get spectrum at below-market value without competing against AT&T and Verizon. There’s no reason, however, to believe that T-Mobile can’t compete in a fair and open auction without federal bureaucrats tipping the scales in their favor. Moreover, even if money were an issue, couldn’t T-Mobile’s multi-billion dollar parent company, Deutsche Telekom, come to its aid? Consider the straightforward numbers: Deutsche Telekom, a German company with a market cap over €70 billion, is a 66% stakeholder in T-Mobile. 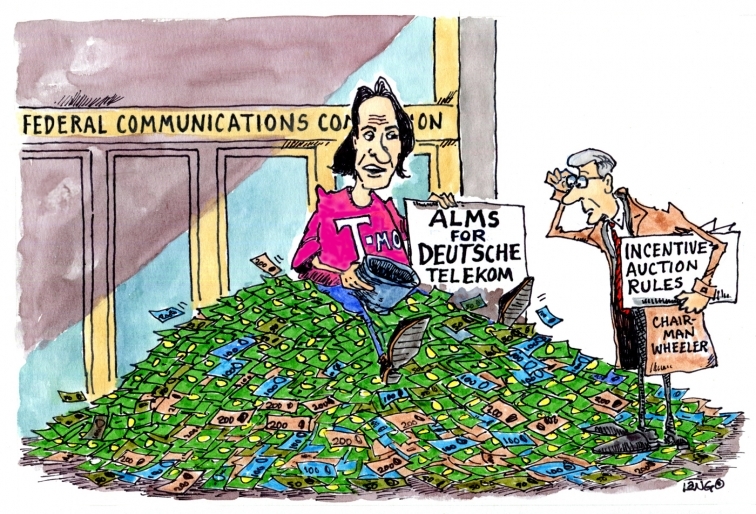 Additionally, the German government maintains approximately a 1/3 stake in Deutsche Telekom. Accordingly, offering T-Mobile an unjustified advantage translates into a giveaway to a foreign company and a foreign government. But what about American consumers? The set-aside could drive down auction revenue, which in turn means less money for the U.S. Treasury and less spectrum that’s sold and brought to market for the benefit of U.S. consumers. FCC Chairman Tom Wheeler recently said that he thinks the set-aside should remain at 30 MHz and NOT get increased. That’s a rare bit of moderately positive news, but if the FCC is really reviewing the set-aside in advance of its July 16th open meeting, it should eliminate this cronyist monstrosity entirely, and send Mr. Legere and his tin can packing. In a letter delivered on Friday, a coalition of 14 free market organizations, including the Center for Individual Freedom (“CFIF”), urged the Federal Communications Commission (“FCC”) to approve a private deal between Verizon and cable companies that will free currently unused spectrum to help alleviate the growing “spectrum crunch” that many wireless consumers – particularly those in densely populated areas of the country – are already feeling. Demand for wireless broadband is more than doubling annually, but vast swaths of valuable spectrum – the lifeblood of mobile communications – remain unavailable to wireless carriers. Consumers in densely populated urban areas are already suffering from inadequate wireless capacity. While meeting this robust demand will require wireless carriers to adopt an ‘all-of-the-above’ approach, increasing spectrum availability is unquestionably the most fundamental and cost-effective means to meet wireless demand. Unfortunately, spectrum auctions that will enable wireless carriers to bid on additional spectrum remain years away. Verizon Wireless’s proposed transfer presents a rare and crucial opportunity to deploy currently unused spectrum for wireless broadband. The spectrum at issue is ideally situated in the 1700/2100 MHz AWS bands, covering over 80 percent of the U.S. population (259 million POPs). Consumers will see substantial net benefits from expanded coverage enabled by additional spectrum, especially compared to more costly and time-consuming undertakings such as cell splitting. With demand for wireless broadband more than doubling annually, the FCC’s own estimates predict that demand for wireless spectrum will exceed supply in 2013. Yet Obama’s FCC has done little if anything at all to make additional and much-needed spectrum available to wireless network operators. In fact, under the Obama Administration the FCC has worked to delay and outright block private-sector deals to alleviate the growing spectrum crunch. Last year, the FCC took unprecedented steps to block the then-pending AT&T-T-Mobile merger, going so far as to publicly release a biased draft staff report in opposition to the merger that the commissioners themselves never approved and quite possibly didn’t even read. Had that merger been approved, AT&T was promising to deploy high-speed mobile broadband to 95 percent of all Americans. And the FCC has been over-scrutinizing and slow-walking approval of the Verizon-SpectrumCo deal since December. Read the full coalition letter to the FCC here. Just months ago, T-Mobile became another unjustified casualty of the arbitrary and capricious Federal Communications Commission (FCC). It was bad enough that the FCC curiously opposed T-Mobile’s proposed merger with AT&T, which would have upgraded wireless service for tens of millions of American consumers and created thousands of new jobs. Compounding that injustice, however, the FCC committed the unprecedented transgression of releasing a confidential staff report that inaccurately maligned the proposed merger’s justifications. CFIF supported T-Mobile’s right to enter into a bargained-for exchange between private parties during its proposed merger with AT&T, which the FCC and Obama Justice Department improperly blocked. But by the same token, it should not turn around and attempt to interfere with other parties’ market transactions. T-Mobile is a subsidiary of Deutsche Telecom, the world’s fourth-largest telecommunications company, which itself is partly owned by the German government. So it’s not exactly David fighting Goliath, unable to contend in the marketplace without exploiting the FCC as some sort of protective big brother. Verizon Wireless merely seeks to purchase unused spectrum, which will bring desperately-needed wireless service improvements for U.S. consumers. That’s none of T-Mobile’s business, and the FCC is not some sort of instrument to be used as a competitive weapon. So federal bureaucrats at the Federal Communications Commission (FCC), those known master micromanagers of the American economy, concluded in their wisdom to oppose the proposed merger between AT&T and T-Mobile, two independent, free, private parties. Along the way, the FCC went to the improper and unprecedented extreme of releasing a staff report gratuitously and inaccurately critiquing the justifications offered for the merger. Again, we’re talking about a merger between two consenting, informed parties. We’re also talking about a merger application that was voluntarily withdrawn by the parties. Yet the FCC, for reasons still unexplained, broke with decades of administrative protocol and published the staff report. Remember, this is the same supposedly omnipotent federal government that managed the housing market so well in recent decades through Fannie Mae and Freddie Mac, not to mention the splendid business acumen it displayed in the energy sector with such examples as Solyndra. And it’s the same FCC that incompetently attempted to commandeer Internet service through so-called “Net Neutrality,” which earned it a unanimous rebuke from the D.C. Court of Appeals and Congress. Turning its eye toward the telecommunications industry, the FCC decided in its considered expertise that the AT&T/T-Mobile merger was not in the best interests of the American people. As one particularly curious example, the FCC staff report claims that the proposed merger would cause job losses. One would think that federal regulators would be more circumspect in asserting job projections in light of the slow-motion “stimulus” disaster that was supposed to cap unemployment at 8% in October 2009. Instead, unemployment stands at 9% and has exceeded 8% for a record number of months. Moreover, if the merger was a likely job-killer, why would even the Communication Workers of America (CWA) labor union support it? The FCC asks us to believe that the labor union most impacted by the proposed merger would somehow seek fewer dues-paying members? Moreover, the FCC itself within the past month claimed that its own $4.5 billion fund to deploy wireline broadband to just 7 million Americans would create “500,000 jobs and $50 billion in economic growth.” Yet it now contradicts itself by claiming the proposed AT&T/T-Mobile merger, which would deploy broadband service to the far greater number of 55 million Americans, would somehow destroy jobs? In other words, the FCC seems to think that smaller amounts of government spending to bring broadband to a smaller number of people will create jobs, but much larger amounts of private investment to bring broadband to a much greater number of people will not. Federal bureaucrats are unequipped to micromanage the telecom industry, just as they’re incompetent to tell Boeing (America’s top exporter) where it can and cannot operate manufacturing plants. It’s yet another example that the FCC is out of control, and threatening American jobs by its malfeasance.